June 8 1909 -- LA is loosening up on the liquor laws by allowing for wine with meals in restaurants. But what constitutes a bona fide meal? Cops are becoming gourmands in search of the answer. There was a profusion of nettles for one traveling alongside the Hearst trail in the early stages of the First World War. The most pernicious thorns bristled from the pen of Philip Francis. He was the writer of editorial leaders for the Hearst morning papers from 1914 to 1921. During those seven years, he sat next to the throne. He was a stormy petrel. Yet no other lieutenant exerted a more noticeable influence on Hearst’s political policies. He seemed to hold not only the complete confidence but the affectionate regard of his employer. Hearst showed this on one occasion to my discomfort. Sinn Feiners vociferous in promotion of an Irish republic and professional patriots of every sort, including revolutionists from Russia, Latin America, the Levant and the dark corners of Europe, flocked around Francis. He posed as a champion of oppressed countries—a Simon Bolivar at the typewriter. Short and squat, with a swarthy complexion, protuberant eyes and saltant gait, he was not prepossessing. Meeting him stirred self-reproach for keeping in mind the picture of a giant toad. No matter how much I might have struggled to entertain a comradely disposition toward Francis, it would have been wrecked by his editorials on the World War. My abhorrence for Prussian militarism approached the nature of an obsession. It had been implanted in my childhood. It was like a personal estate. So Francis’ predictions of German victory kept us at arm’s length. An open clash with him followed a full-page spread that appeared in Hearst newspapers of November 23, 1916. It was a broadside with a twenty-five-year echo—a blast of Homeric mockery in which we may espy the silhouette of Lindbergh accepting a torch from Francis in a prophet’s relay. My displeasure over this diatribe was sharpened by word that German authorities had provided for its translation into forty-odd languages and for the distribution of a hundred million imprints. The facts were like smoldering embers in my mind when I next saw Francis. We met in the library of W. R. Hearst’s Riverside Drive apartment. A stickler for niceties would not have approved the conversation. Beginning with a challenge of Francis’ knowledge of military affairs, it touched on patriotism, loyalty and lineage. Francis was especially vigorous in claiming the background of seven American generations. The entrance of W. R. Hearst interrupted our colloquy. Maybe Hearst thought we were going into a dance. The bunny hug was popular at the time. Hearst put his arm around Francis and led him away. Francis was expostulating. George Thompson, Hearst’s valet, watched from a balcony overhead. Five feet two, roly-poly, with fringes of red hair setting off his ivory baldness, Thompson was as much a major-domo as a body-servant. He was truly clairvoyant in his master’s intimacies. A moment after Hearst and Francis had withdrawn, George Thompson told me “Your appointment has been canceled.” That should have been convincing enough proof of the high preference in which the court favorite basked. Other instances were to follow. All contributed to the enigma of a death certificate that several years later sealed the name of Philip Francis in one of the unsolved mysteries of the Hearst organization. The story unfolds itself in subsequent pages. The initial momentum of King Features Syndicate carried it through the growing war menaces of 1916. The progress of Newspaper Feature Service also continued, despite the gathering storm. But as America approached a state of belligerence, my professional enthusiasms fell under the questioning of a troubled mind. The same urge that drove me into the volunteer army of 1898 was again pressing upon me. Now, however, the path of duty was not so plainly marked. Time had entrusted me with potentialities that transformed my capacity for service. Journalistic resources committed to my keeping could be more efficiently marshaled for national victory than any field force the leadership of which I might reasonably expect to attain. The sounding, maintaining and stimulating of morale could be organized into a military effectiveness. No matter how meager were the final results, the merit of this reasoning was to be confirmed by the logic of events. My first skirmish on the home front was with George Creel, Chairman of the Committee on Public Information. It had been generally assumed that he would surround himself with seasoned journalists. A considerable number of his selections irritated members of the Fourth Estate. 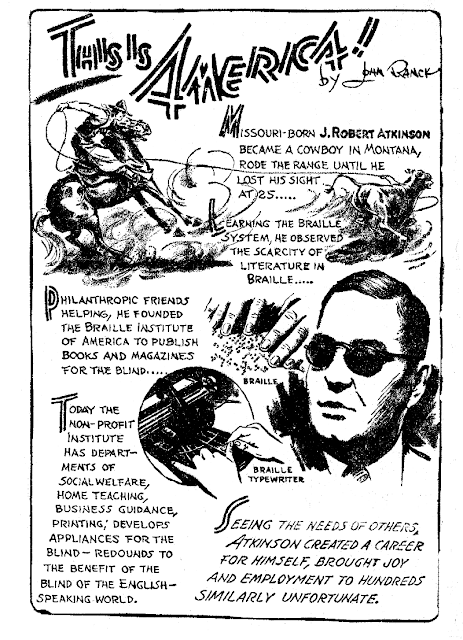 He chose quite a few committeemen with newspaper experience of the next-door or across-the-hall variety—advertising, circulation and promotion workers. Perhaps I went to our meeting handicapped with a prejudice. My Denver friends, Frederick G. Bonfils and Harry H. Tammen, owners of the Denver Post and the Kansas City Post and at one time employers of Creel, had painted him to me in an unfavorable light. They were especially critical of his conduct as Bonfils’ companion on a trip to Africa. Bonfils undertook the journey to the tropic jungles to meet former President Theodore Roosevelt and persuade him to run for the presidency in 1912. The stunt was a grandstand performance to promote the Denver Post. It was not judicious to accept without reserve the Bonfils and Tammen version of a private controversy. But my parley with Creel prompted the thought that, for once, the Denver partners might have landed on the right side of a quarrel. It was proposed to the chairman of the Committee on Public Information to place at his disposal the facilities of the two syndicates under my management. In addition, cartoons and articles, of a number subject to agreement, would be devised and distributed without effort or expense on the committee’s part. The engagement would lay on Creel one requirement. He must put himself on record as earnestly supporting the demand for an unreserved declaration of newsprint as a wartime essential. In the 1940-41 regulations, that would have meant setting a fixed priority. It would spell official assurance of shipping space for the paper to be consumed in the publication of newspapers. Acceptance of my proposal would have greatly advanced cooperative relations between Creel and a considerable section of the newspaper fraternity. His failure to earn the favor of a larger number of publishers was regrettable. But it was no more depressing than the shyster methods with which some of them attempted to translate war conditions into the disadvantage of competitors. Most of the schemes were ingenious. In the main, they were twofold. First, the field of interest in which a successful rival held leadership was to be discredited. Then a supply of newsprint was to be withheld equal to the quantity represented in that leadership. And all these pleasant artifices were presented as patriotic measures. An example was the movement to eliminate classified advertising for the duration of hostilities. It was skillfully camouflaged. Tabulated reports were analyzed in an effort to show how central bureaus—civic auxiliaries of the army compiling directories of lodgings, vacancies, undrafted personnel and similar data— would minimize the usefulness of the want ad. This was specious enough to color the claim that here was a model illustration of how to make great savings of tonnage for military purposes at the least public inconvenience. The idea seems to have first found expression in Philadelphia. There was no need to mention that the Philadelphia Inquirer had long since outdistanced its morning contemporaries in small ads; that premiership in this sphere, as in other departments of newspaper success, was more dependent on habit than any other factor; and that, once lost, it would be recoverable only in a competition in which all the entrants could start from scratch. This ruse to liquidate supremacy in classified advertising got no farther than the more audacious though not so well reasoned maneuver to equalize circulation by limiting the size of headline type. One of the postulates of this notion was that such part of a heading as extended beyond 72 points—one inch—was sheer waste. The strongest and the most aggressive campaign to employ wartime regulations for the discomfiture of newspaper rivals was directed against the colored comic. Of course, the gentlemen who formulated the strategies of this undertaking may claim that they were inspired only by patriotic motives and publishing considerations. What actually happened remains more significant than any interpretation they may choose to offer. It would have been idle in 1917 to dispute the preeminence of the Hearst “funnies.” In metropolitan competition, the New York World and the Chicago Tribune Sunday comics trailed along together far behind the leader. By syndication standards— in number of newspaper outlets of distribution apart from total circulation—the Newspaper Feature Service pages ranked ahead of both the New York World and the Chicago Tribune sections. This was the state of colored comic affairs when F. B. Knapp, manager of the New York World syndicate, visited me on a formal errand. Knapp made it clear that his call was in behalf of both the New York World and the Chicago Tribune. The two publications had agreed to proceed together in a program of patriotic sacrifice. They purposed to decrease the consumption of newsprint in the United States by many thousands of tons. The aim was to save 50 percent of the stock used for comic supplements by printing the pages in half-size. My cooperation was requested. Without it, Knapp said frankly, the project might fail. The adherence of a large majority of Sunday publishers was requisite for success. Defeat was certain if I held the ready-print clients of Newspaper Feature Service in line against the step. To cut in two the most conspicuous part of the Sunday newspaper would be a radical departure. If the New York World and the Chicago Tribune were bent so eagerly on an act of heroic abnegation, why did they pause for my assistance? Why didn’t each of them set an example for others to follow without asking for the aid or consent of anyone? Knapp had said success or failure depended on the course to be taken by Newspaper Feature Service. Success or failure at what—saving newsprint or depreciating the colored comic? The garb of patriotism covering this proposal needed a dry cleaning. It was questionable whether the mathematics of the scheme would hold water. If all the “funnies” in the country were halved, the resultant conservation would total little more than one percent of the white paper consumed. And that boon would be offset by the bane of fiscal dislocations through wage shrinkages. The shadow of guile loomed behind the seemingly gallant gesture of the New York World and Chicago Tribune. A cunning design became discernible. The power of an instrument of popularity may be fixed by the volume of its application. The smaller the space a feature occupied, the less would be its pull. Slashing the comic supplement in two could be calculated to make a corresponding split in its potency. The Hearst leadership would thus be crippled to that extent. Those in the rear of the procession would lose nothing. Their relative positions would remain the same. Indeed, they might find greater advantage in the abolishment than in the mere belittlement of the “funnies” until the end of hostilities. Then, before peace was restored, a realignment of competitive resources might be effected. Much of this fine-spun ratiocination received ironic endorsement in the tabloid which arrived a few years afterward. The newcomer proved that a half-size could be extremely successful—at half price. My refusal to chop down the “funnies” had evidently been anticipated. I felt that Knapp secretly sympathized with my stand. He notified me that the Chicago Tribune would not abandon its purpose. He understood that it would go over my head in an endeavor to convert my customers to its will. 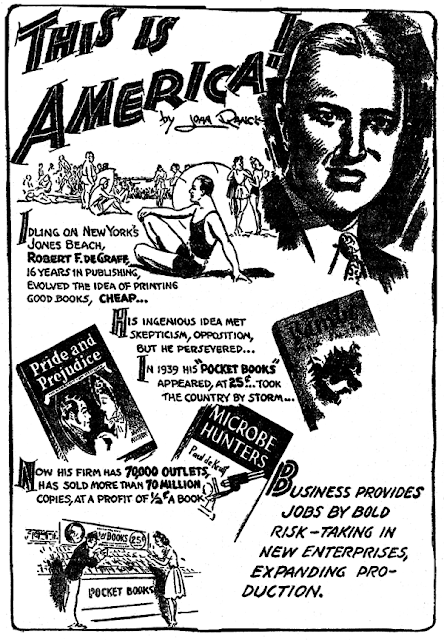 Two days later, he reported that the Chicago Tribune was sending “a call to duty” to all the publishers of comic sections in the United States. It was a broadside of five hundred telegrams. It was an appeal for “comradeship in a patriotic measure.” It included an astonishing proposition. The Chicago Tribune offered to bear the financial burden of installing the change it recommended. It would make the necessary engravings and matrices at its own expense for any publisher so desiring. But even that striking exhibition of altruism failed to move a single client of Newspaper Feature Service. Possibly the generosity of the proposal brought under suspicion the high idealism which professedly inspired it. Up to that point, the battle had been in the open with legitimate weapons. Then came an attack from behind. A bureau of the United States government joined the opposing forces. A letter reached me on the stationery of the War Industries Board. It was signed by Thomas Elliott Donnelly, Newsprint Controller. It purported to be written “in the national interest.” It was plainly a circular communication. It advised publishers to lessen the demand for tonnage by decreasing the dimensions of comic sections. A reduction of 50 percent was suggested. My capacity for righteous indignation has been a source of satisfaction. But it was taxed to the limit by Donnelly’s brazen message. It was no longer only the colored comic for which I must fight. Here was a bureaucratic attempt to stifle the freedom of the press. There was no question of federal authority in wartime to limit the cargoes deliverable to civilians. But if only an ounce of newsprint reached a publisher, he must enjoy perfect liberty to make whatever use of it he might elect. To restrict the quantity of white paper usable in one part of a newspaper was an assumption of the power to apportion the amounts allowable for the rest of the publication. The thought was intolerable. The Newsprint Controller was a Chicagoan. It might be wholly unwarranted to deduce that his action was responsive to the wishes of the Chicago Tribune. But the coincidence was at least remarkable. It drew added significance from the fact that Donnelly was an associate of Herbert Bayard Swope, assistant chairman of the War Industries Board. 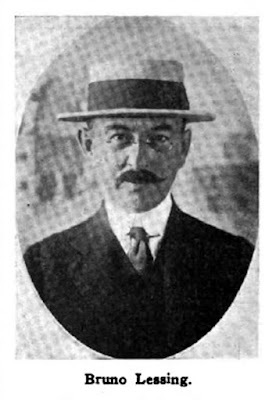 Swope had been appointed to his post from the staff of the New York World. He maintained an affiliation with that newspaper for a number of years, serving as its executive editor after the war. Throughout his coruscating career, Swope has shown a rare zest for manipulating men and affairs. My earliest meeting with him was in the ’90s in St. Louis. There, his reputation was long tied to the memory of the first pair of spats worn by a Missouri journalist. The spats did a lot to distinguish him in those days, though in later years they struck a minor note in the verve of Swope’s ensemble. Herbert evinced a keen curiosity when he saw me in Washington outside Donnelly’s office. His concern about my mission became quickly enveloped in a grinning reticence. In the next few hours, he passed me several times. His growing amusement was not fully hidden. At seven o’clock I stopped him. “If I leave tonight without seeing Donnelly,” I announced, “I’ll go to President Wilson tomorrow.” Swope shrugged. But Donnelly presented himself shortly thereafter. The Newsprint Controller was astonishingly acquiescent. He agreed that the War Industries Board possessed no legal right to determine what matter should appear in or be omitted from any newspaper. By the same token, it was unauthorized to apportion to any part of his publication a publisher’s quota of printing stock. Donnelly admitted “the possibility” that, because of the letterhead on which it was written, his communication “might be misconstrued” by some of the recipients as having the force of a governmental direction. He promised to sign a specific denial of such meaning. The document would be handed to me the next day. Meanwhile, before tackling official Washington, it had seemed proper for me to apprise W. R. Hearst of the facts. He might care to take a hand in the game. He wanted not only one but a number of hands. He would furnish all the help I needed. He would instruct W. A. DeFord, chief of his legal staff, to join me at once. Other of his lieutenants would follow without delay. My protest must be pressed to a quick decision. 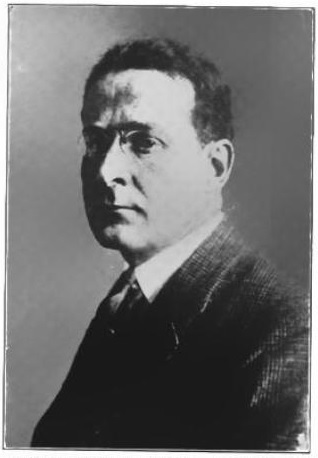 With DeFord came Rudolph Block, editor of the Hearst comics and more widely known as Bruno Lessing, author of a notable series of farcical yarns, among them the Lapidowitz series. DeFord and Block were present at my second meeting with Donnelly. They witnessed an emotional explosion that left me with an indelible regret. It was the sort of melodrama that only an exhibitionist might recall without discomfort. In extenuation, however, may be pleaded the greatest rage that had ever seized me. The Newsprint Controller had taken counsel overnight. He refused to carry out his promise. The manner of Donnelly’s statement was as exasperating as its text. “We have decided not to tie our hands with such a commitment as you have asked me to write,” he said, in the same tone with which he might have dismissed a request for alms. Against that fanfaronade should be credited the offender’s ready submission to restraining hands. The outburst had not been fruitless. Donnelly volunteered to resume consideration of my demand. Thereupon, I withdrew, leaving to DeFord and Block the task of getting from the Newsprint Controller the written instrument concerning which he had broken his pledge. Donnelly delivered the writing to DeFord two days later. But that did not terminate the war-time war on the comic supplement. The last attack came four months before the Armistice. Walter G. Bryan, publisher of the Atlanta Georgian, telephoned me from Asheville, N. C. He was attending the annual meeting of the Southern Newspaper Publishers’ Association. Some misguided patriots had “gone haywire.” They had persuaded the convention to adopt a resolution to eliminate color supplements in order to release a corresponding tonnage for military uses. No sectional newspaper organization enjoyed higher standing with the national administration. Its conclusions would surely be accepted by Washington officialdom as warranting translation into general effect. Bryan had exhausted his ingenuity in a vain effort first to defeat and then to delay the action. Now he called on me for help. The importunity was at least flattering. It implied the possibility of rescuing a forlorn hope in a deliberative assembly of which I wasn’t even a member. But the issue was too commanding to permit the weighing of personal equations. Bryan had obtained a special invitation for me to speak the next day during a period to be interpolated in the regular program. The winning of a war depends on two branches of science—physics and psychology. The layman is accustomed to look to the first—in the application of material forces—for the decisive result. The expert regards the second— the intangible resources of the mind—as the determining factor. Napoleon said that in warfare the ratio of the mental to the physical was as three to one. Bismarck observed that wars were won with imponderable elements. Both were affirming the paramountcy of morale. Both knew that the will to conquer was the supreme requisite of a victorious army. Whence comes that spirit? It is inseparable from the home, for the security and the ideals of which the patriot has gone forth to fight. The firmness of the front line is measured by the determination of those in the rear. It is the family that holds the last trench. In the domestic circle burn the fires that light the soldier’s way. Those fires, fueled by tradition, are fanned by habits of thought. In the guardianship of those habits of thought the press fulfils its highest duty—the most sacred office of journalism. General Pershing has appealed for the maintenance of “the cheerio spirit” back home. That message echoes the wisdom of Napoleon and Bismarck. It bids us to stand sentinel over the customs, practices and usages—including the sports, games and amusements—that are the lifebuoys of our national temperament. Yet it has been proposed in the name of patriotism to discard one of the largest single elements of “cheerio” in our normal establishment— the colored comic. The Germans seek to overcome the minds and wills of their adversaries. The end for which they strive could not be more fully served than by lowering the level of the American temper. . . . Casualty lists will soon be coming along. We need all the cushions available to soften those shocks. I find nothing patriotic in a plan to impair or to lay aside any instrument of mirth and good cheer. On the contrary, the patriotic course of the American newspaper runs in the opposite direction. A publisher can render no better service than by expanding his circulation and so providing matter to lighten the hearts of a wider circle of readers than he has been reaching. . . . Morale is essential to victory. We are an emotional people and on more than one occasion our sense of humor alone has saved us. . . . The convention of the Southern Newspaper Publishers’ Association graciously accepted my suggestion. It reconsidered the resolution for a suspension of color supplements. The matter was referred back to the same special committee on conservation of newsprint that had started the trouble. An all-night session was held. Members hesitated to reverse themselves in too abrupt a right-about-face. A solution was found in a parliamentary device. The committee renewed its report. It was a general affirmation of the association’s loyal adherence to the government’s policies. But the revised finding contained no recommendation. All allusions to color sections were omitted. The "funnies” were saved. Twenty-three years later, in the Second World War, a scientific survey was made of the reading habits of American soldiers. The canvass was conducted by Dr. Lyman Bryson, of Columbia University. The result was a formal endorsement of the comic as a major stimulus of morale. No newspaper feature matched the popularity of the “funnies” in the cantonments. My thesis of 1918 became a demonstrated principle in 1941. The favorable consideration accorded to my views by the Southern Newspaper Publishers’ Association was at wide variance with their interpretation by Dr. Alfred McClung Lee in his labored tome, The Daily Newspaper in America. He used a professorial incubator to hatch out of one passage this gist: “Anything to divert attention from the facts.” He assumed that I sought to hide the truth about the war. The humidity of this assumption was understandable. It welled from the same springs of exuberance that fed some of Lee’s statistical freshets. In point was his testimony before the Federal Communications Commission in July, 1941. He showed that during the preceding decade the dailies newly launched exceeded the number of established newspapers that disappeared. A most enlightening discovery! Equally illuminating would be the observation that the canoes, manned by lone anglers trying unfished waters, outnumbered the fleets of trawlers and whalers that ceased operation in the same period. "Blondie, so soft, so bouncy, Blondie, so slight ..." indeed! Patricia Harty is a worthy successor to Penny Singleton, but other than that, boy, what a hokey show; kinda creepy even. Somehow the show was kept on the air for thirteen episodes, according to IMDB. I still have this book, missing the front cover and falling apart. I remember watching the show, but don't remember anything specific about it. I do know that the young actress who played the daughter appeared on other TV shows of the era, even if I don't remember her name. Looks like Pamelyn Ferndann to me. She has another comic strip connection; she voiced Lucy in some of the Peanuts specials. 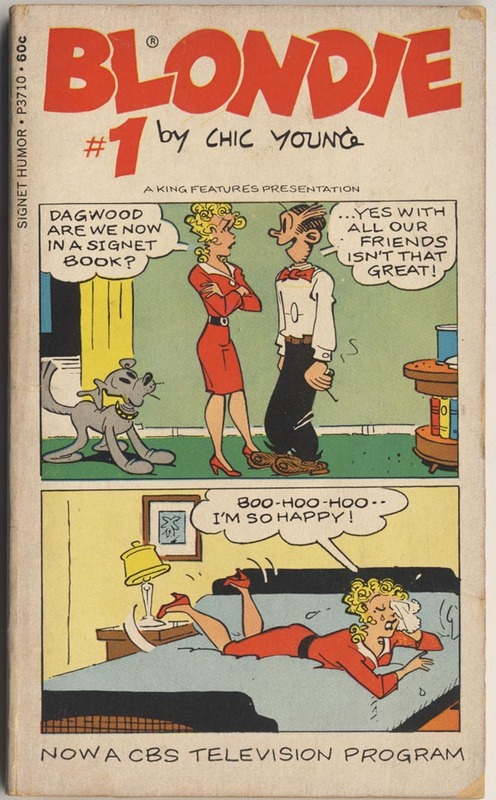 I remember this series as well as it's 1957 predecessor where Arthur Lake reprised his role as Dagwood from the 1938-50 movie and radio series. In that one, Pamela Britton played Blondie. It was a flop, a midseason replacement for LIFE OF RILEY, and only about twelve episodes were made. The 1968 version seemed a halfhearted affair, the actors were young and unknown, they looked too young, even too small to match up to the firmly ingrained Penny Singleton and Arthur Lake personifications, still present by way of the popular video presence of the old movies. The only recognizable faces were the oft-used child star Miss Firdin, and the obviously embarrassed Jim Backus as Dithers. The series was bad, and to make things worse, it was sent to the "Death Spot" by CBS, pitting it against NBC's DANIEL BOONE. It lasted a half a season, leaving only one note of interest, an episode that had Dag learning self-defence with the help of Bruce Lee. The show ended forty-nine years ago yesterday. Singleton later did the voice for Jane Jetson, playing opposite George O'Hanlon (familiar from a long series of "Joe McDoakes" comedy shorts). Blondie had a half-hour animated special at some point; I only recall that Alexander was a teenaged inventor. Blondie, Garfield, Hagar, BC, Family Circus, For Better or Worse, Ziggy, Doonsbury, Pogo, Cathy, Far Side, and probably some others got the half-hour special treatment. Peanuts accumulated enough specials to qualify for a series (and then they went ahead and made a series anyway). I recall a Popeye special, but that was a spin-off from Hanna Barbara's Saturday morning version. There were two animated Blondie specials in the 1980's; BONDIE AND DAGWOOD (1987) and BLONDIE AND DAGWOOD-THE SECOND WEDDING (1989). Loni Anderson was Blondie's voice. They were made for Hearst in Japan by Marvel productions/Toei Animation. Not only did Pamelyn Ferdin provide the voice for Lucy in "A Boy Named Charlie Brown" but the boy, Peter Robbins, was the voice of Charlie Brown in several shows. 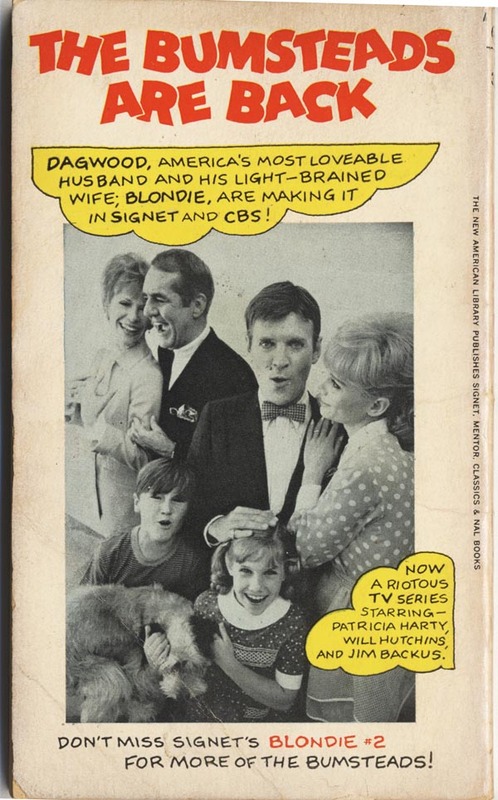 Dagwood was played by Will Hutchins, who starred in the Western series "Sugarfoot." You may want to buy the 2015 book "Blonde Goes to Hollywood: The Blondie Comic Strip in Films, Radio & Television" by Carol Lynn Scherling. A paperback will cost you about $25.00 at Amazon. Since you liked the Singleton-Lake movies you should check out the surviving episodes of the "Blondie" radio series that aired at the same time. 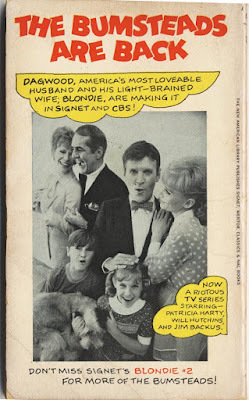 Arthur Lake was always Dagwood in this series, but Blondie was played by Singleton, Ann Rutherford, and I believe at one time by Lake's real life wife Patricia. It is amazing how many cartoonists and their creations have appeared on radio and TV over the last 80 years. John Van Buren “Jack” Ranck was born in Pennsylvania on November 15, 1875. His birthplace is based on census records and the birth date is from the Social Security Death Index. Ranck has not been found in the 1880 U.S. Federal Census. Information regarding his education and art training has not been found. The Philadelphia Inquirer, June 14, 1895, published the following classified advertisement. Artist—Original pen artist wants position on paper or lithographic designing or sketching. Jack Ranck, Burlingame, Pa.
An 1896 Columbus, Ohio city directory listed a “John V Ranck” who was a draughtsman residing at 189 North 5th. In the 1900 census, Ranck resided in Philadelphia, Pennsylvania at 28 53rd Street. He and his wife, May, had a year-old daughter, Dorothy. His occupation was recorded as “Plaster”. The 1906 Cleveland, Ohio city directory said Ranck was a Cleveland News artist who lived at The Naylon. Ranck was still with the News in the 1907 directory but at a different address, 640 East 115th NE. Ranck appeared to be a freelance artist, at “16 Wick blk”, in the 1909 directory which had his address as 10800 Orville Avenue NE. According to the 1910 census, Ranck was a Brooklyn, New York resident at 380 East 17th Street. He was an art manager. 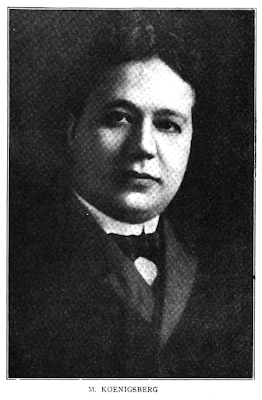 The 1912 and 1913 New York City directories said Ranck was an editor who worked at 203 Broadway in room 906, and resided in Brooklyn at 1618 Beverly Road. 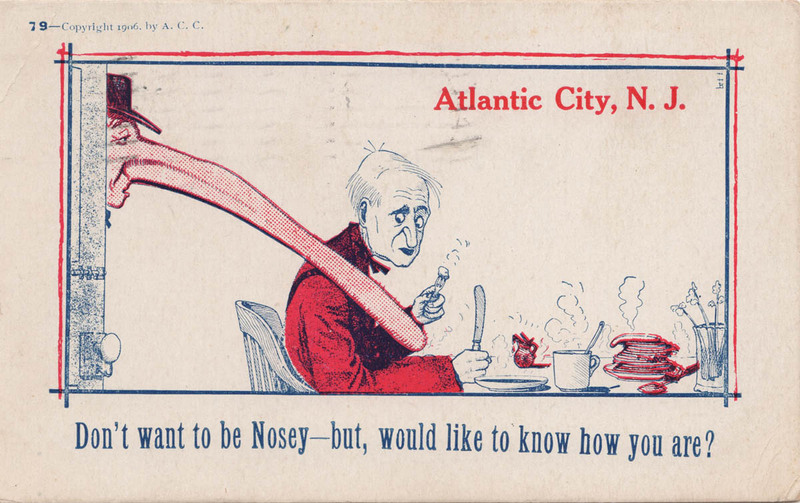 American Newspaper Comics (2012) said Ranck drew Household Hints, from September 19 to 30, 1913, for the New York Evening Mail. The following year Ranck produced The Uniped, which was written by C.L. Edson and ran from January 13, to April 3, 1914 in the Evening Mail. Ranck was one of many newspaper artists who attended the dinner by the publication committee of the Motion Picture Board of Trade. It was held at the Hotel Astor on March 12, 1916 and reported in The Editor & Publisher and The Journalist, March 18, 1916, and Motography, March 25, 1916. Ranck produced artwork for scores of sheet music covers. Ranck’s full name appeared on his World War I draft card which he signed September 12, 1918. The self-employed artist resided at 18 Oak Lane, Mountain Lakes, Morris County, New Jersey. He was described as medium height and build with brown eyes and gray hair. Ranck the illustrator continued to reside in New Jersey in Boonton at Mountain Lakes in the 1920 census. Ranck maintained a studio in Manhattan at 1170 Broadway, room 1103, in the 1922 New York City directory. In 1925 and 1926 his Manhattan studio address was 235 West 40th. The 1930 census recorded Ranck as a self-employed magazine illustrator whose home was Mountain Lakes, New Jersey. A 1933 directory listed Ranck’s Manhattan studio at 56 Cooper Square, 11th floor. According to American Newspaper Comics, Ranck illustrated a series of milk panel advertisements from 1938 to 1939. Commercial illustrator Ranck’s address was 221 Fairview Avenue, Boonton, New Jersey, in the 1940 census. That same year, the first issue of Reg'lar Fellers Heroic Comics published two pieces by Ranck. American Newspaper Comics said Ranck drew the series This Is America! for the Independent Press Service. The series ran from1944 to 1949. The Altamont Enterprise (New York), June 6, 1947, published an editorial cartoon by Ranck. Manhattan, New York City directories, from 1957 to 1960, listed Ranck at 25 Tudor City. Ranck passed away in November 1965. The Social Security Death Index said his last residence was in New Jersey. Ranck was laid to rest in Wildwood Cemetery. Advertising Features: This Is America! Here's a feature that inhabits a weird gray zone between ad features and public service features. This is America!, penned by veteran illustrator John V. B. Ranck, was a series of panels and strips that told the stories of successful American entrepreneurs. As best I can determine it began as a weekly offering in 1944 (although this bio of Ranck claims he started it in 1941), changed to a strip around 1946, then went back to a panel, and the frequency was reduced to monthly through 1949 at least. There's no doubt in my mind that this series was offered as a freebie to newspapers, because you'll find it running haphazardly as a space filler in some of the smallest rural papers. Usually these features are either trying to sell a product, or are issued by a government or other non-profit entity as a public service. This is America! definitely isn't trying to sell a product, and it didn't come from the government. That leaves it in that curious genre of features that were given away by some entity in order to push their ideas, rather than their products, on the public. This one evidently is trying to push the idea of entrepreuneurship, so perhaps it was commissioned by the Better Business Bureau or some similar organization. We cannot find out anything more based on the feature itself, as there was no syndicate/source identified. The only clue we get is the 1949 edition of Editor & Publisher's Syndicate Directory, in which This Is America! makes its sole appearance. The listing there credits something called the Independent Press Service. Unfortunately that has been a dead end for me, as I can find no information about this organization. Am I seeing things or did the artist use the negative space of the horse's rear leg to include an image of a woman's face 3/4 turned towards the viewer, her right eyebrow cocked on the top This is America sample?